I was chatting with a friend recently about my recent diet and she commented that I seemed to measure everything. I realized that measurement and logging was a theme in my lifestyle, specifically as applied to productivity. As a Type 1 Diabetic logging and measurement as a precursor to success is not just required, it's darn near mandatory if you to live succeed. I check my blood sugar as often as 10 times a day. Now that I'm also on a continuous blood sugar meter as well, I am able to measure hundreds of times a day and make small adjustments. It's this core idea of measure often combined with small adjustments that I believe is the hallmark of success in nearly anything one does. I have been dieting of late (I'll do a separate blog post on this soon) using an application called LoseIt and a pedometer/metabolic activity meter called a FitBit. These two small and inexpensive (LoseIt is free so far!) measuring devices have enabled me to lose 21 lbs in a short amount of time with minimal effort. The old adage is "measure twice, cut once." In the computer age, my new agile adage is "measure often, cut often." One of my favorite tools for measuring personal productivity (and making adjustments) is called RescueTime. It's a little app that runs in the background and keeps track of the application running in the foreground, as well as if you're interacting with it. You can categorize applications with various levels of productivity. For example, for me, reading CNN.com is not productive, but if you're a journalist, perhaps it is very productive. You can categorize from apps down to websites, as well a ones you want it to ignore. They even have a lovely Data API that you can access programmatically and do whatever you like! Once you've run RescueTime for a while, maybe a week to a month, things become VERY interesting from a data perspective. You can pivot the data any way you like, focusing on Productivity, Efficiency, or by Category. If you're an hourly worker or consultant, you can even upgrade and us it as an effective time-tracking tool. Here's some examples of the kinds of insights you can get when you measure, and what you (or I, in this case) can do about it. I'll pick a random day in May, the 17th. There's some uncategorized data in there where I'm using an application or website that RescueTime doesn't recognize. Notice that I don't really hit my stride for Software Dev until lunch time. If I look at the week or month views, I find this to be true consistently. I'm garbage with analytical work (development) until lunch. What can I do about that? Well, I can totally avoid that kind of work in the morning. Did you realize that you can be more productive by actually avoiding work at times when you know you'll be lousy/unfocused/suboptimal? If you rock at a certain kind of work at 11pm, then well, organize your day so you can be successful that those times. If I dig in on an hour, for example, noon to 1pm on this day, I can see that I was developing software (in Visual Studio) for 35min, using utilities for 10min, and googling around for a few minutes. Other distractions used up only seconds. I can dig in and categorize my programs and their relative productivity/distractedness (it's like Mint.com, do the work once, and it'll add up over time!) and that makes my reports easier to read at a macro level. You shouldn't need to spend much time doing this. Then, once a week, during your Friday afternoon "Reflection," go look at your reports and see if you find patterns. Then, make a list of the 3 things you'll do on Monday to make your week more productive. Repeat this each week and you'll find an LEAST 4-8 hours of wasted time. I'm not saying don't read the news or go on Twitter. Time is finite, treat it as a resource. Be aware of what the trade-offs are. Measure everything, otherwise you have NO idea what you're doing. If you don't profile your program, you don't know where it's spending it's time. If you don't profile yourself, you're just hanging out. Hope this helps, Dear Reader. I used RescueTime from August 2010 until last month when I cancelled my subscription. Just like you said, it immediately did wonders for my productivity just to see how I actually spent my time in cold, hard numbers. It almost became a game to try to stay in the "You're in the top 10%" category. I was (and still am) a big fan and evangelized their service to quite a few friends. So why'd I end up cancelling? For one, there were very few new features developed during the 9 months I used it. It's a simple service, and already pretty mature, so maybe that's not a good reason, but I guess in this fast-paced internet age, I expected a little bit more. And two, after 9 months, the data was all the same. It was fun to see the one week where I put in 80 hours of productive time, but other than that, I knew what to expect, and I just didn't see the value anymore. +1 for RescueTime from me! 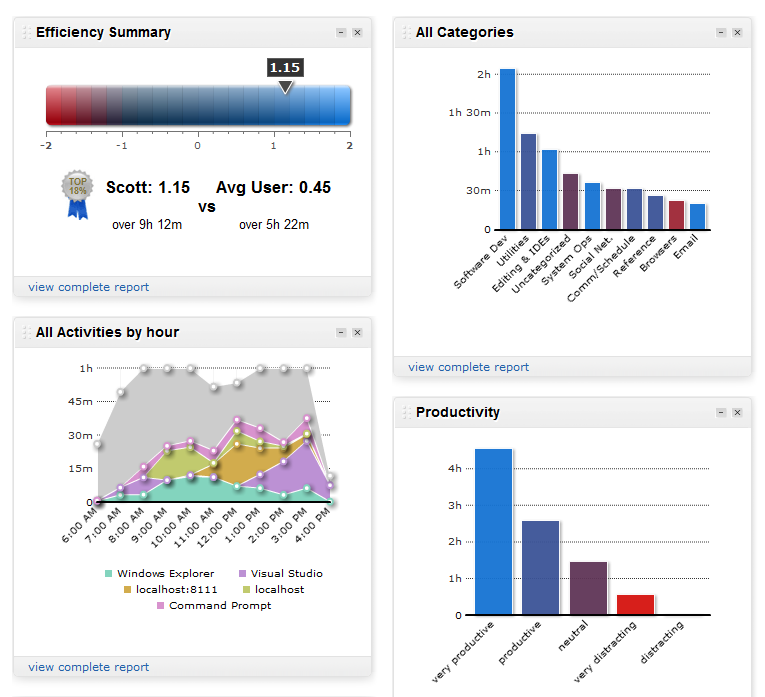 They also have great widgets that you can add to a blog and team accounts if you want to monitor multiple employees. Also while Ken is correct that the website/desktop version has not had many new features recently, they just announce a new version that runs on Android phones and can tie into location and app data on your phone. They also are VERY quick to apply fixes. I remember a few occasions where the Chrome data link stopped working and they fixed it within a matter of hours. If you enjoy the software I recommend liking it on their AlternativeTo page to give it a boost. That site also lists a bunch of other software that tracks your usage on the computer, but RescueTime is the best one I have tried so far. I'm curious about your experience with LoseIt. Did you find that it took some time to start losing weight? I've been using it for about two weeks after seeing you mention it on Twitter, and set what I felt was a very achievable goal of losing approximately one pound a week for the next 4 1/2 months. Despite logging all food and drink (this bit is perversely satisfying; I've taken to whipping out my iPhone halfway through a meal or snack to log what I'm eating), and staying well under my weekly calorie budget, I've found that my weight has remained constant. I did start a 2x weekly cardio and weights exercise program at the same time, after being extremely inactive, so it's possible that I'm gaining muscle and weight at the same time that I'm trying to lose fat. Ken - I'm not too worried about new features. It's pretty amazing as it is. Other than general speed of the site, I have no need for additional stuff. If you've reached the top of the productive time heap, then I can totally understand why you wouldn't need it. For me, I just leave it running in the background, harmlessly, and when I feel like a week wasn't productive, I can go back and find out why retroactively/retrospectively. Nick - I started losing weight at 1200cal a day within 3 days. I've went from 195 to 173 within about a month. I'm starting to plateau in the last week (even though I'm aiming for 165 or so. I suspect my body thinks it's starving, so I will now incorporate a cheat day where I'll do 2000-2500 calories, as well as more body fat measurements. I could support 195 on my 5'10" frame, but it would have to be muscle. I suspect that would take more daily protein than I'm willing to take as well as a lot of anaerobic exercise. Can you use this tool to help with tracking time spent on projects? Besides improving productivity, I'm looking for a hassle-free way to track time (which my company wants me to do since we bill by the hour). Would RescueTime help me with that? Can it show for instance what solution I was working on in Visual Studio, or what wiki page I was editing on our internal wiki site, or even what meeting notes I was working on in OneNote? Thanks for the reply. I'm aiming for 173 from 188, at 1 lb a week for 15 weeks. For my gender / height / age combination and weight loss goal, LoseIt has allotted me a sizable 2180 daily budget which I've generally remained under. On two days last week, for example, I exceeded my daily budget by 300 calories. Overall, I was under my weekly budget by 1,713 calories. Like you, I could support my current weight if it were muscle, but since it isn't, I'd rather lose that extra weight! I'm just trying to figure out if LoseIt was too generous with my calorie budget. I did round my height up since I'm in exactly between inches, but lowering it by an inch only shaved 23 calories off my daily budget. I'll probably continue as is for another week, and if I don't see any improvement, set a more aggressive goal. Best of luck with that last 8 pounds! Loved the article. Very nice. Thank you. Nick - Thanks! Also, remember that 3500 calories is 1 pound. That'll help put things into perspective. Mike - Yes, you could use this for tracking time for a project. I believe that is part of their pro-system. Something else to look at is TimeSnapper which tracks EVERYTHING you do like a DVR. Great for consultants. You can prove anything with numbers. Interpretation is everything. That's why you should always set out what you want before collecting any numbers. Most people will have a hard time interpreting the numbers correctly, if there is a correct way. For example it's not because you spend most of your time in VS that you are also productive it just means you spent time in VS. You might be very productive reading twitter because someone just mentioned something that will really increase productivity in another area which you would have otherwise missed. Productivity is hard to measure but whatever helps helps. And of course context, context, context. Glad you got it down to 173, I knew you were jealous of my awesome body last time we met. But watch out for the up-down effect, your body will get used to the low amount of calories and adapt (like the borg). In forensics we take a Bayesian approach to deal with the numbers and to make the interpretation easier. Which means that you do a pre-evaluation where you state the numbers you want to achieve before you can draw a conclusion given the current facts then you collect the data and take the pre-evaluation to see what matches with which conclusion. I'll stop rambling now, sorry. Thanks, Scott. I've been looking for something to help me get more productive. RescueTime looks a like a great way to start! I am using free subscription of Rescue time around 4 months.Great product. It helped me a lot to understand my actual productive time, track productive goals and do better estimation. I am considering to upgrade to be able separate work hours from my home hours. Right now looking to link it with pomidoro technique, because spending 7 hours in VS doesn't mean you moving into right direction and staying focus working on top priorities. Rescue Time is great. I started using it after reading Hanselman's earlier post and I realized that how much time I was wasting on gTalk and other disturbing website and applications. productivity has gone up since then. Has anyone inspected the data that RescueTime Sends back? Maybe I'm paranoid. I like to measure and improve as you do. Lately I heared about the negative health effects of sitting(http://zenhabits.net/stand/)... Someone built a standing desk to solve this problem but it sounds odd to me... I'm trying to combine something like the pomodoro tecnique with my weight training, to both standing often and productively use rest time too. 5 minutes each 25 minutes is ok to stress a muscular sector at a time to improve shape. Try to determine the weight to lift chosing the one you can't lift more than 12-15 times and keep your rest time between sets really short: 30-40 seconds. You don't need to collect a big number of reps but you have to stress muscles to make them reacting and getting bigger. Try to work each muscle with different exercises instead doing more sets of the same one. I tryed many different exercises and machines but lately I'm focusing on calisthenics. I think it is a powerfull, higly portable kind of gym. Well, I just signed up for RescueTime. I'm a bit apprehensive about the numbers that I'm going to see, but it can only help. I consider myself about half OCD and half ADD. I think that RescueTime will reveal a more accurate ratio. Thanks for the tip, Scott. I have been using myfittnesspal.com with similar success. I looked at lose it just now and they look pretty much the same. My Fitness Pal has phone apps for Android and BlackBerry too. I don't believe my fitness pal works with fitbit though. One question on RescueTime is, how well will it measure disruptions for you. I spend much of my day answering questions for others and providing assistance to them. Lots of walk-ups throughout the day which makes true concentration pretty difficult at times. I would like to find a non-evasive way to track the time I spend on disruptions. I use two machines "simultaneously" at work. One is my main development machine, and the other is my mail machine which I'm remoted into from the dev machine. I was optimistic that ResumeTime would "do the right thing", but it really doesn't. If I go use my mail machine after coding for a while, RescueTime asks me "What have you been doing for the last X minutes while you were away?". So I had to disable that feature even though I'd like to use it when I'm coming back from meetings, lunch, etc. 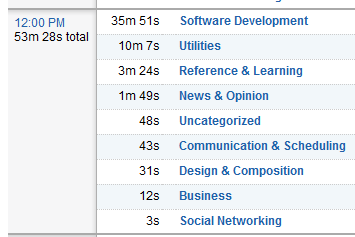 Also, in the RescueTime reporting, my time spent reading mail is hidden behind a "MS Terminal Services" facade. Maybe the solution is to stop using remote desktop to get to my mail machine, and instead use one of those utils that lets you magically use the same mouse/kb across multiple machines/screens. Or a KVM -- blech. Anyone dealt with these issues and have thoughts? I work at a place that has separate (physical) machines for development and email except the email box is on a completely different network that is highly secure and therefore not accessible to me via remote desktop. Hence I have to turn and use a separate monitor, mouse and keyboard. I don't find this to be a problem, sure I get the "What have you been doing..." pop up when I turn back to my dev box, so I just have a button configured that says "Email". That way when I'm checking my reports, it's easy for me to see how much time I have spent on 'work' email. Personal email I do though gmail which gets tracked on my dev box as normal. It's very easy to differentiate the two in the reports. If you feel it needs more info than just "Email", then go right ahead and fill in some more details in the textbox, that will then show up nested under the Email section in the report (I didn't realise this for the first few months). I actually really like the configurable buttons on the popup. I have 3 generic buttons labelled "Prod", "Distract" and "Neutral". I use these ALL the time to tell it about stuff that happens beyond the software's reach, like conversations with colleagues, pairing with another developer (on their machine), meetings, etc... Sometimes I've even included (very brief) summaries of solutions to problems that I have then referred back to when asked about them later. I really have found it to be a multi use tool.